The knee joint is the largest joint in the body with complex anatomy. It is a hinge joint and like a hip replacement has been developed over many years with much success. It is generally done later in life on people who have chronic osteoarthritis, rheumatoid arthritis or other inflammatory conditions. It is important to try manage symptoms before surgery with physiotherapy or steroid injections but studies have shown earlier intervention before the knee has become too stiff can lead to better outcomes. Knee replacements have become very common and serious complications are rare. It is important to point out however like all operations there are certain risks involved. joint revision due to instability caused post-operatively. 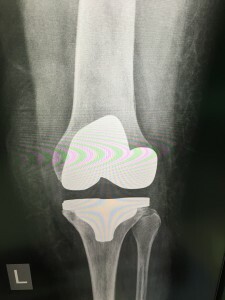 Total knee replacement means that both sides of your knee are prepared and replaced. The surgeon makes an incision at the front of your kneecap and moves it to the side for the duration of the procedure. The damaged ends of both your femur (thigh bone) and tibia (shin bone) are carefully cut into shape and prepared for the new joint surfaces. Special rigs designed to carefully size the bones are used by the surgeon to prepare the bone ends for their new prosthetic. A trial joint is also used to ensure the joint is working properly before any final decisions are made. The bone ends are cleaned and the final prothesis is fitted using a special cement. The end of the femur has a curved prosthetic and the tibia is replaced with a flat metal plate which often has a small lip for stability. A plastic spacer is placed between the pieces of metal and act like cartilage reducing friction as the joint moved. 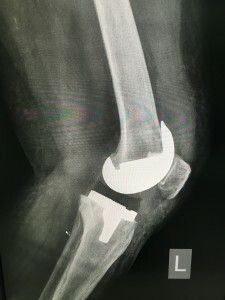 The knee cap may also be tidied up by the surgeon and can be shaved and “replaced” if necessary. Similar to the hip replacement fluids or a blood transfusion may be indicated after surgery depending on blood loss. Patients are also provided with ample pain relief as they are advised to start moving the joint as soon as possible. A large dressing will be applied to your knee and can be changed while you are in hospital if necessary. You will be encouraged to stand within 24 hours of your surgery and a physiotherapist will show you different exercises to strengthen your leg as well as reduce swelling. Most patients can generally go home within 3-5 days.